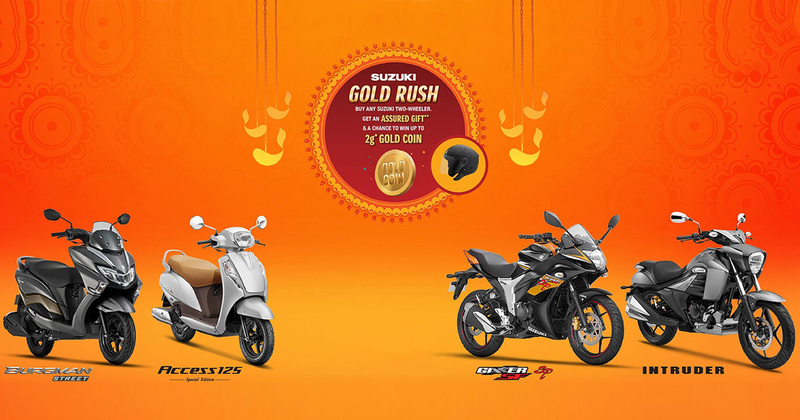 Suzuki Gold Rush is a special offer sponsored by SUZUKI MOTORCYCLE INDIA PVT LTD. Any individual who purchases a Suzuki two-wheeler during this “Offer Program” is eligible for an assured gift during 10th Sep' 2018 to 30th September' 2018 (both dates are inclusive). Besides, Tamil Nadu and Pondicherry, the offer is applicable for all Indian states including Union Territories. However, the buyers from Tamil Nadu and Pondicherry will be benefited with the assured helmet prize. The winner for the Gold Rush Offer will be selected randomly via using an algorithm from SMIPL. Well, all the rights regarding any participant exclusion from Offer Program are reserved to SMIPL. The firm can through any person out of programme on the grounds of misconduct or criminal record or conviction of any crime or subjected to crime investigation. -Any SMIPL’s two-wheeler buyer with age above 18 is applicable to participate in the scheme, excluding institutional, organisational or corporate purchases. -SMIPL’s employees and their families, SMIPL’s agents, distributors, retailers, other channel partners (including their employees) are not applicable to participate. -Price Claim: Only those who possess documents a photo ID Proof, Address Proof, and the original Invoice (provided through Suzuki Dealer Management System only) are valid to claim price. The contrary will result in cancellation of the price. -Any participant registered under NDNC (National Do Not Call), DND (Do Not Disturb) registry regulation can also get call of being shortlisted as they voluntarily participated and agreed on program terms and conditions. -Winner will be selected randomly through an algorithm conducted on cumulative participants data (chassis number or code) provided via authorised dealers. -The winning price will only be handed over to the winner, if not available on time, the price will be fortified. -A helmet either of Studds or Steel Bird depending upon the availability is an assured gift on the purchase of any Suzuki two-wheeler. While participants also have a chance of claiming 1 gram or 2 gram gold coin of 22 carats on a monthly lucky draw. -Any taxes and levies on the price will be borne by the winner. Also, once you win a price during Program Period, will not be able to win any further prizes again. -Winning candidates will be contacted to collect their prizes from respective SMIPL dealers with following documents. Why Suzuki Discontinued Hayate and Let's in India?